Northeast Florida nest of Romeo & Juliet. © American Eagle Foundation. What is the size of a Bald Eagle nest? Most nests are about 6 feet across at the top, and with two adult eagles and one, two, or sometimes three young in the nest, it can get pretty crowded. Especially when you consider that as the nestlings approach fledging age, their wingspan is six feet or more, taking up most of the nest. Nests can get very deep—one was recorded in Florida that was 22 feet deep!—because most pairs add sticks to the same nest each year, and use them for many years. How do bald eagles establish a territory? 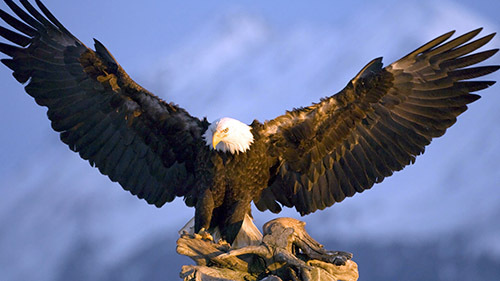 Given the option, Bald Eagles will choose a ‘super-canopy’—one rising above the rest—tree with sturdy limbs and a commanding view of the surrounding terrain, which is also always very near to water. Typical nest heights are 50-125 feet high. Eagles that live in the extreme North, where trees large enough to accommodate an eagle nest are very rare, may build their nest on the ground. This is not an optimal location. On the Channel Islands, where large trees are also very scarce, Bald Eagles have built their nests on cliffs. – PN, and others. Who builds the nest? The male or the female? Both are involved. Both eagles find nesting material—grasses, sticks, branches—and bring them into the nest. Both eagles move the sticks around; sometimes both have the same branch in their beaks at the same time and walk around the nest with the stick. One eagle may place a stick in one place, only to have the other eagle move it to another place—and this can happen multiple times! What is an egg bowl? Prior to the female laying eggs, the male and female will gather lots of soft nesting material—grasses, Spanish moss, whatever is available, and build a ‘bowl’ or ‘cup’ inside the larger nest. This bowl/cup will be the area into which the eggs are laid, providing them with a soft cushion. After the eaglets have hatched, the sides of the bowl/cup will help keep them in one place where the parents can shelter them more easily. why do Bald Eagles bring springs of greenery to their nests throughout spring and summer? 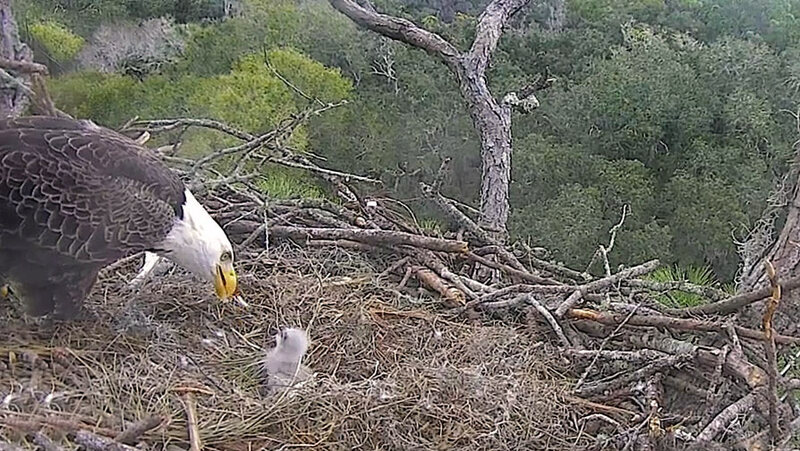 may be a clear signal to other eagles that this nest is well-tended so they better keep away.